Model VT020-3 vibration plate uses a cam mechanism to generate pivotal oscillation, resembling the motion pattern of a teeter-totter, just much faster. With its larger size, this model achieves higher max amplitude. Compared to our high speed model VT003F, Model VT20-3 runs on low to medium vibration frequency range, 5 - 15 Hz. Such a vibration pattern is designed for users primary focusing on weight management, pain reduction, and micro circulation improvement. 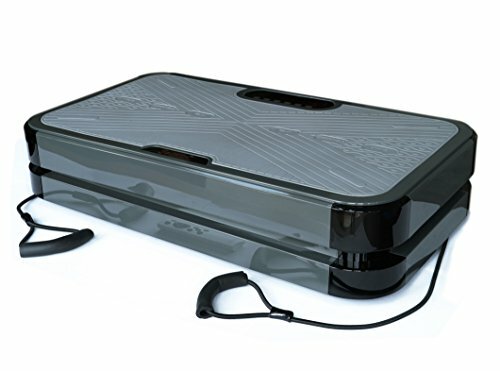 In general, VT vibration plates are beneficial for fitness, body fat loss, blood circulation improvement, bone density enhancement, muscle relaxation and pain reduction. This vibration plate comes with a remote control and a pair of resistance bands. VT vibration plates are made to last with durable structure, high quality material, components and parts. The machine work very quiet even at the highest speed. This makes the built-in bluetooth speaker very enjoyable. It is a good experience letting the machine to work on your body while watching TV the same time. Great fit for your office as well as your bedroom. Machine size: L28" x W16" x H5.9"
Pivotal oscillation (swing) type of vibration, Low to medium frequency. Vibration frequency: 5 - 15 Hz; Max amplitude: 0.39"
Operates very quiet even on the highest frequency; making the built-in Bluetooth speaker very enjoyable. If you have any questions about this product by Vibration Therapeutic, contact us by completing and submitting the form below. If you are looking for a specif part number, please include it with your message.